Suspected pirates involved in the attempted hijacking in April of the OS35, a Tuvalu-flagged cargo ship, are seen after Chinese navy officers handed them over to the Somali authorities in the city of Bosaso. The Chinese navy on Friday handed over a notorious pirate leader captured last month after a failed hijack attempt. Abdikarim Salah "Aw Koombe" and two other pirates are now in the custody of Puntland security officials at the Red Sea port of Bosaso. The three, who were in handcuffs and wearing flotation jackets, were brought to the port in small rubber boats. Colonel Yasin Ali Nur, commander of security forces at Bosaso port, told VOA Somali reporter Fadumo Yasin Jama, the three will be tried on piracy-related charges. "These three prisoners, their weapons, will be kept here at the prison at the port until they are transferred to the central prison, until they appear before a court," Nur said. Chinese navy officers dock on the shores of the Gulf of Aden to hand over three suspected pirates involved in the attempted hijacking in April of the OS35, a cargo ship. 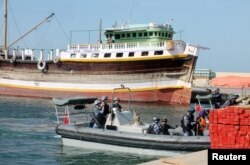 One of the three prisoners was involved in up to 26 hijackings, said Abdimajid Samatar, director of Regional Ministry of Ports and Marine Transport which overseas anti-piracy activities in Puntland. It's believed Samatar was referring to Aw Koombe. The pirates attacked the Tuvalu-flagged ship on April 8 off Socorta Island. The crew had locked themselves in a safe room making it impossible for the pirates to steer the ship toward the Somali shores. Chinese and Indian navy ships reached the scene and rescued the ship. Pirate leader Aw Koombe spoke candidly about what happened on the ship in an exclusive interview with VOA after his handover by the Chinese navy. He told VOA that three of them boarded the ship in an attempt to hijack it. He said they ran into difficulties after the crew locked themselves in the safety room. To avoid being captured by Chinese crewmen who were deployed on the ship by helicopter, Aw Koombe said he and the two others hid on the ship. "I was sleeping 12 hours throughout the night. The next day, they [the Chinese navy] heard a bit a of noise. They find out where we were hiding, then they apprehended us," he said. "I’m back home, the sight is pleasant, my mind is good, I'm back with my people, I'm not missing anything," he said. Aw Koombe is a well-known pirate leader who authorities say was involved in many maritime attacks against ships over the years. But, in a VOA interview, he denied being involved in any other attacks. Asked what drove him to try to hijack this ship, he said: "Whatever reasons that were given ... poverty. Is there any other reason?" A report released this week by the maritime group Oceans Beyond Piracy said declining vigilance is giving pirates an opening to renew their attacks on ships traveling near the Somalian coast. The report said after several years of decreased pirate activity, ships are sailing closer to shore and the number of naval vessels patrolling the waters near Somalia has dropped. Fadumo Yasin Jama contributed to this report from Bosaso, Somalia.